Today’s guest post is by Austin Maitland, who has been a Strong Towns contributor since 2017. All opinions expressed herein are his own. You’re in the bread aisle at your local grocery store. You have a choice of wheat, white, rye, cinnamon, sourdough, etc. You can choose breads that are organic or non-organic, gluten-free or with gluten, freshly baked or pre-packaged. Some loaves come sliced, while others come whole. Some are round, others rectangular. Some have soft crusts, others crispy. A similarly overwhelming number of options are available throughout the grocery store. Whether you’re shopping for meat, produce, or cereal, you have a dizzying array of food options at your disposal. The driving force behind this variety is the diverse preferences and budgets of shoppers. Some shoppers are gluten intolerant, so grocery stores respond by providing bread without gluten. Other shoppers value the natural qualities of food so the store offers organic products. Some shoppers may be hosting a dinner and therefore willing to pay more for a higher-quality loaf of bread while others just need to pack a lunch and are happy to pay less for bread shipped from a large facility. There is no centralized entity coordinating the incredibly complex system of food production, distribution, and pricing that puts our favorite bread on the shelf at prices we can afford. Rather, the system is an example of an emergent order comprised of millions of voluntary transactions between private individuals and entities in the market. We enjoy a similar level of choice and accessibility in other parts of our lives. When buying a phone, we can choose between various sizes, cameras, screen qualities, and operating systems. We can spend $80 on a basic Android phone or over $1,000 on the latest iPhone. The same is true for cars. Some of us are happy with a $15,000 Hyundai Elantra while others are willing to drop $80,000 on an Escalade. An amazing aspect of free markets in America is that whether you are buying groceries, phones, or cars, people in essentially all developed parts of the country have access to a plethora of choices. The answer is probably most of them. Shoppers in much of the American housing market are presented with essentially one flavor of housing: the detached single-family home. American towns are defined by winding roads lined with houses neatly centered on individual lots (bonus points for a heavily-fertilized lawn and white picket fence). Features that could be tailored to individual preferences, such as square footage, lot size, home value, and walkability to surrounding businesses, have been foregone in favor of largely homogenized subdivisions in vast swaths of the country. The town of Ontario, New York, like many developing suburbs, proactively banned all development on existing farmland except single-family housing. Single-family zones are depicted in gray. Cupertino, CA, home of Apple’s headquarters, permits little more than single-family houses on most of its highly-desirable land. Many of these subdivisions follow a standard formula of 2,500 square-foot houses on half-acre lots located in isolated developments that require traveling by car for something as simple as picking up milk. The homogeneity in housing product results in a similar homogeneity in housing price within neighborhoods. Whether you buy a $175,000 Cape Cod in suburban Pittsburgh or a $1.7 million ranch house in Silicon Valley, odds are that your neighbor’s house looks, and costs, about the same as yours. So why are our choices so limited when it comes to housing? The answer lies in the regulations that guide development patterns. Unlike the grocery store, where the product selection is dynamically adjusted to meet consumer preferences, the housing options available to us are largely dictated by zoning regulations. Since the start of the suburban experiment in the mid-20th century, municipal governments have religiously enacted zoning ordinances that include lists of permitted uses on virtually every parcel of private land. The list of permitted uses is often especially short when it comes to housing options. Crack open virtually any suburban zoning code and you’ll find a variety of residential districts called something along the lines of “R-1 Residential” or “R-10 Single-Family Residential.” There is no standard for these zone names, so each code will be slightly different. But two aspects are almost always the same. 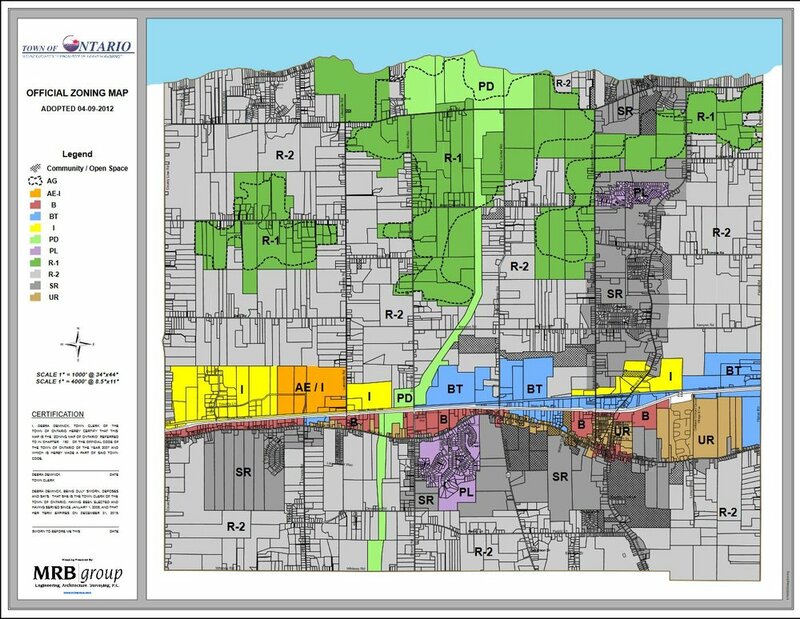 First, these residential zones constitute virtually all land available for housing in the municipality—upwards of 80% or 90% is common—and second, the list of permitted uses is generally limited to single-family homes. Now, there isn’t anything inherently wrong with a single-family house. I grew up in one, just like millions of other Americans. The problem is when local governments permit only single-family homes to the exclusion of all other forms of housing. When we’re surrounded by one type of housing most of our lives, it’s easy to forget that neighborhoods once offered housing as diverse as the selection of food available at a grocery store. 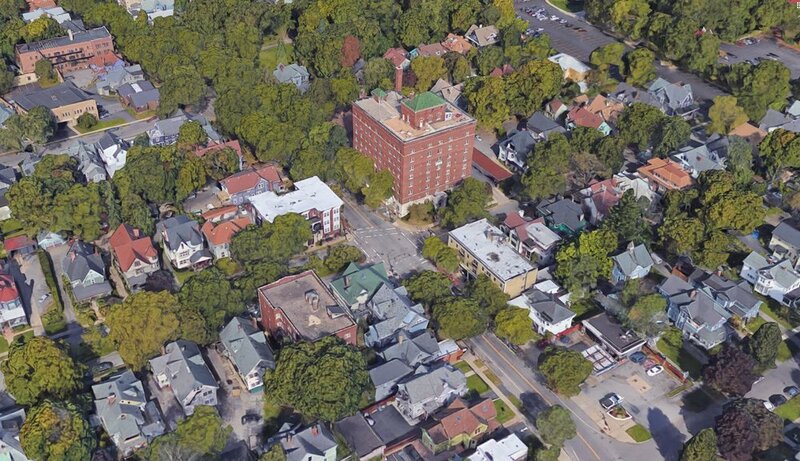 For proof, just look to any neighborhood that developed prior to modern zoning standards. The historic Park Avenue neighborhood of Rochester developed at a time where apartment buildings, duplexes, and townhouses were allowed alongside single-family homes. In a neighborhood offering a variety of housing types, those who are wealthy or place a higher value on privacy may choose to purchase a single-family home; conversely, those of fewer means or who simply want to avoid the headaches of homeownership may choose to rent an apartment. But neither buyer is excluded from the neighborhood altogether, because the neighborhood accommodates both preferences. For a modern example, consider Houston, Texas, the only major city in the United States to lack traditional zoning; in other words, the city does not directly regulate what type of development may or may not occur on each parcel of land. 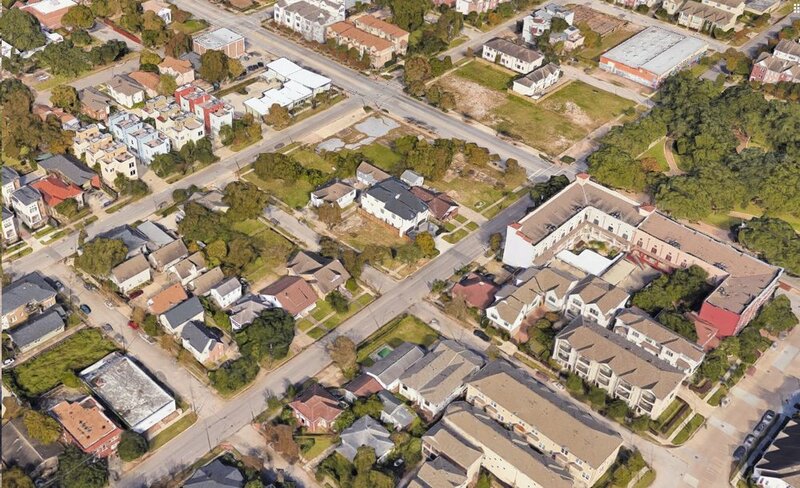 In Houston, developers are able to incrementally grow neighborhoods with a wide variety of uses, including small apartment buildings, single-family homes, duplexes, townhouses, and even commercial establishments within a block of each other as seen in the accompanying photo. The myriad housing options cater to different income levels and housing preferences without the need for centralized planning. Both examples offer a glimpse into a world of light-touch intervention in housing development; both examples also fly in the face of mainstream zoning principles which presume that nearly everyone will live in a house surrounded by a yard, and that no house can be located next to anything other than more houses. Yet when we look at places that grew up before this consensus arose, we find neighborhoods that are considered desirable and vibrant today—but would be illegal to build today. The eclectic mix of housing types and businesses along Park Avenue in Rochester makes it one of the most sought-after addresses in the area; and Houston, supposedly the Wild West of planning, is home to a booming population and economy while maintaining a level of affordability unparalleled by highly-regulated cities like San Francisco or New York City. Liberalizing development regulations can play an important role in creating a more accessible and desirable housing market. However, this is not a matter of promoting an urban or suburban lifestyle; rather, it’s about allowing land to be used in ways that more closely reflect the diverse range of needs and priorities of the entire population, including people of all means. As city leaders and planners grapple with on-going affordability challenges, they may find solutions in the municipal code; with some fundamental changes to zoning regulations, the housing market could once again offer the level of choice and accessibility as the wall of bread in aisle 5.